Total has agreed to buy a 10 percent stake in the Arctic LNG 2 project from Russia's Novatek, as the French energy group looks to build up its presence in the area to service a fast-growing Asian market. The companies said on Tuesday Total would also have the opportunity to buy a 10-15 percent direct interest in all Novatek's future LNG projects on the Yamal and Gydan peninsulas. Novatek said that, as well as paying for the 10 percent stake, Total would provide some financing through capital investment for Arctic LNG 2, adding it expected preliminary capex for the project to be $20-21 billion. "Arctic LNG 2 fits into our strategy of growing our LNG portfolio through competitive developments based on giant low cost resources primarily destined for the fast growing Asian markets," said Total chairman and chief executive Patrick Pouyanne. Total said its overall economic interest in the new project would be around 21.6 percent, taking into account its 19.4 percent stake in Novatek. It added that should Novatek decide to reduce its participation in Arctic 2 LNG below 60 percent, Total would have the opportunity to increase its direct share up to 15 percent. The Arctic LNG 2 project aims to develop more than 7 billion barrels of oil equivalent (boe) of resources. It is expected to have a production capacity of 19.8 million tonnes per year (Mt/y), or 535,000 barrels of oil equivalent per day (boe/d). 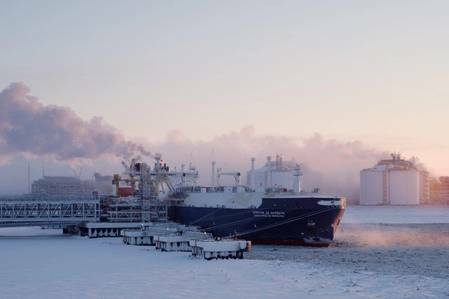 Total said the LNG would be delivered to international markets by a fleet of ice-class LNG carriers using the Northern Sea Route and a trans-shipment terminal in Kamchatka for cargoes to Asia, and one close to Murmansk for European cargoes. A final investment decision to go ahead with the project is expected to be taken in the second half of 2019, with plans to start up the first liquefaction train in 2023, Total said.